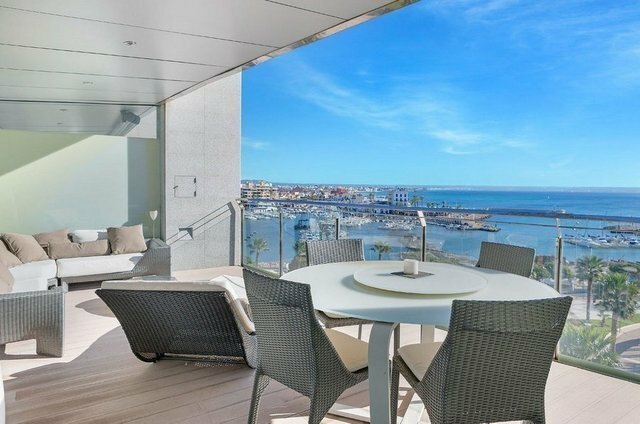 This modern apartment on the seafront with spectacular views of the marina of Portixol and the sea, with the only sandy beach in Palma right at your feet. In just 15 minutes on foot you reach the cathedral, the airport is only 5 minutes away. It consists of living room with dinning area, kitchen, two terraces, master bedroom with bathroom en suite and dressing room, another bedroom with bathroom en suite, plus two bedrooms that share a bathroom, a toilet, laundry, etc. The property has 2 underground parking spaces and a storage room. The communal area offers two swimming pools, a small playground, a paddle court and 24 hour security.